Sports Techie attended the recent Comcast Cablepalooza event and was in for a surprising sports technology ride at the Shilshole Bay Beach Club located across the street from our office in Seattle, WA. 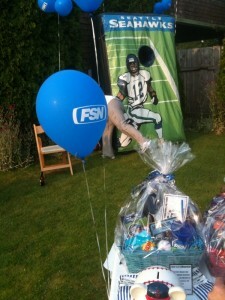 The first Cablepalooza interactive event I participated in was the football toss into the Seattle Seahawks inflatable. Throw the fb into the small hole and you win a ticket for a chance to win one of three prizes. Choices included either: four Seattle Mariner tickets in a hosted Suite at the Safe; a College football package with the Apple Cup at the final season of the UW Husky Stadium ; or, a Seattle Sounders FC seat and party pack at rockin’ Qwest Field. FSN’s sportscaster Angie Mentink was throwing at the same time as I was. She’s got a super arm and it was easy to see that she’s was indeed a former UW softball player. Here was what I call a ‘Sports Techie moment.’ Techie photographers were present along with many Seattle celebrity and peers who watched as I took my sports turn. Tried to focus in on remembering the mechanics needed to make good football throws taught by my former MSU, East Lansing babysitter, coach Jimmy Raye of the SF 49ers, especially the follow through. I nailed two of four shots while Angie made one of four. She chirped about it and wanted more throws but it was game over and I walked on. Winning a Royal Pains USA Network Frisbee playing bocce ball out on the lawn was a relaxing follow up event. The closest toss to the first ball wins the game. I lost the game but won anyways with cool swag. I put the friz into the Discovery Health (DH) – ‘get fresh with sara snow’ – green, tote bag give-away. Next, I had a conversation with a local Seattle marketing expert who challenged me as to whether NASCAR has a new racing car. She said no, I said yes. They do. it’s the Nationwide Series. Sensed a real Sports Techie inside wanting to get out in her. The ESPN “World Series of Poker” Tables unfortunately had no one playing yet. The Golf Channel putting challenge was next up on my things to do list. Suddenly, I decided to take a step back and observe all the semi-formal wear and look around this classy waterfront establishment. Well-dressed people mingled everywhere I looked, fun décor was all over the place and good energy was flowing. As I continued scanned the room, I found myself standing next a tough looking dude in a black t-shirt and jeans. Since we had both dressed down at this semi high-brow event, a natural bond seemed to already exist between us so I struck up a conversation. He said his name is Stephan Bonnar and he’s a UFC fighter. I sort of recognized his face from his PPV events. 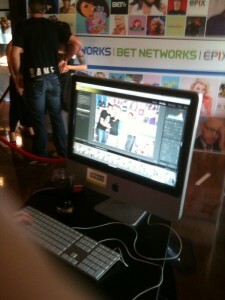 Stephan was here with Spike TV to pose in front of the BET Networks (BET) high-tech looking photo opportunity for the Cablepalooza guests. 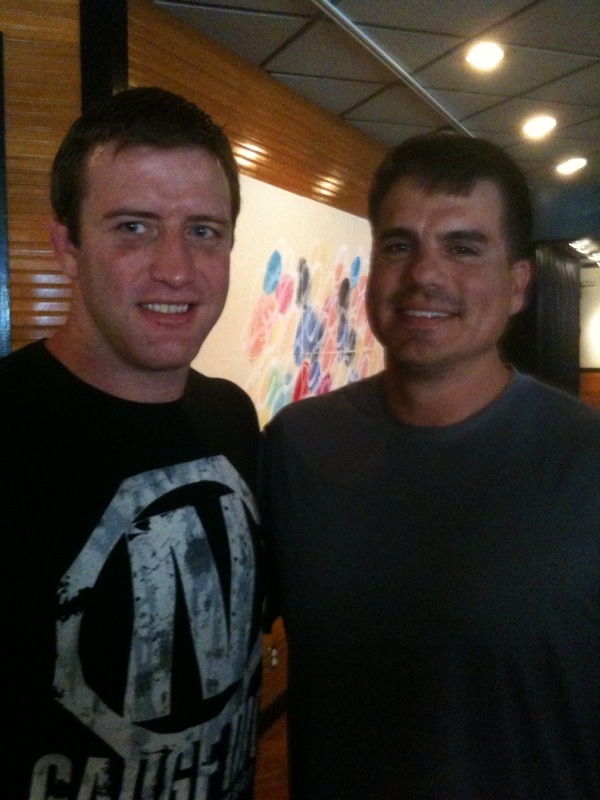 I’m about 220 lbs and Bonnar told me he comes in at 205 which enabled me to look him straight in his Octagon hardened eyes. I felt Sports Techie talking to him just like I did with Angie at the football toss. I asked Bonnar about his career and he reflected back that founder Dana White had said that his fight was the UFC 116 “fight of the night.” Stephan was losing the first round when he turned it around in the 2ndwith a knee to the head, eventually taking his Polish challenger out for the win. I asked if he was on Twitter and he said no but he’s on Facebook where I’m now following his career at: FB. Thanks to my sports technology-centric iPhone by Apple and fearless work ethic, this personal Sports Techie moment is captured on film and in this Blog. Appreciate you taking this picture at Cablepalooza 2010 SB. I tweeted this picture to ComcastWA who responded in-kind. MTV Real World New Orleans cast members made an appearance. 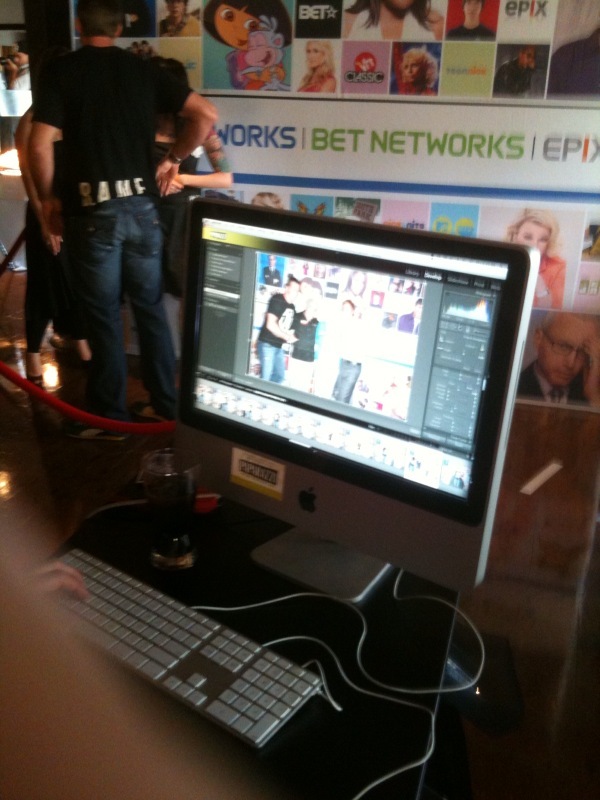 The Cartoon Network Ben 10 photo booth was busy. There was plenty of local food specialies like crab cakes, salmon, sushi rolls and fresh salads along with delicious desserts via the Cooking Channel and Food Network Culinary Creations. The Martha Stewart Summer Cocktails via Hallmark Channel and the Turner Networks Waterside Lounge and Martini bar was an all-night sensation. Lifetime beauty message tents and card reading where busy throughout the evening. The Cablepalooza ambiance amplified when the incredible sunset overlooking the Puget Sound and Olympic Mountains finally occurred. Thought about sticking around and checking out the Fox News Huckabee rock band booth or perhaps getting a FX Sons of Anarchy tattoo but decided to say goodnight. Thanks to Comcast Cablepalooza 2010 for a Sports Techie lifetime experience. Spoke to Glenn Beckmann with Schutt Sports (est 1918) yesterday, look for this new Sports Techie Blog next week.